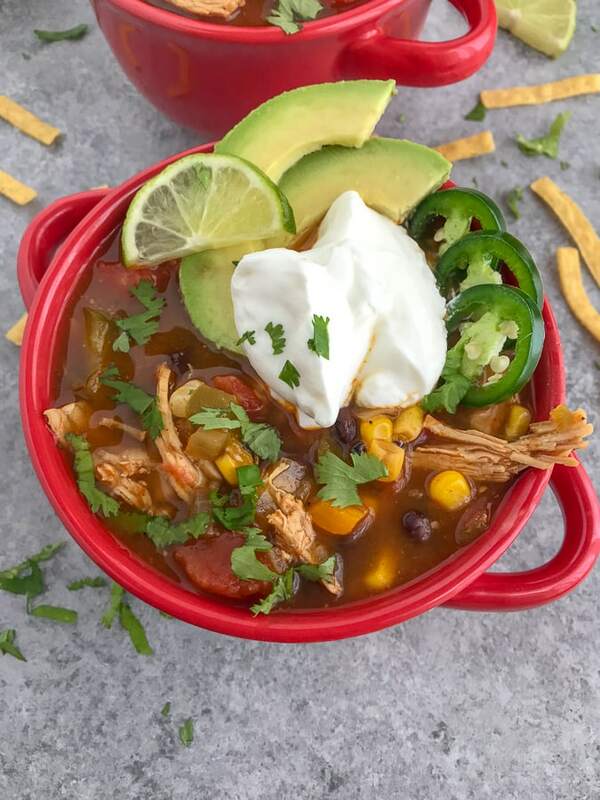 Easy Instant Pot Chicken Taco Soup – A simple, delicious, and healthy recipe that is perfect for these cold, rainy fall or winter days. 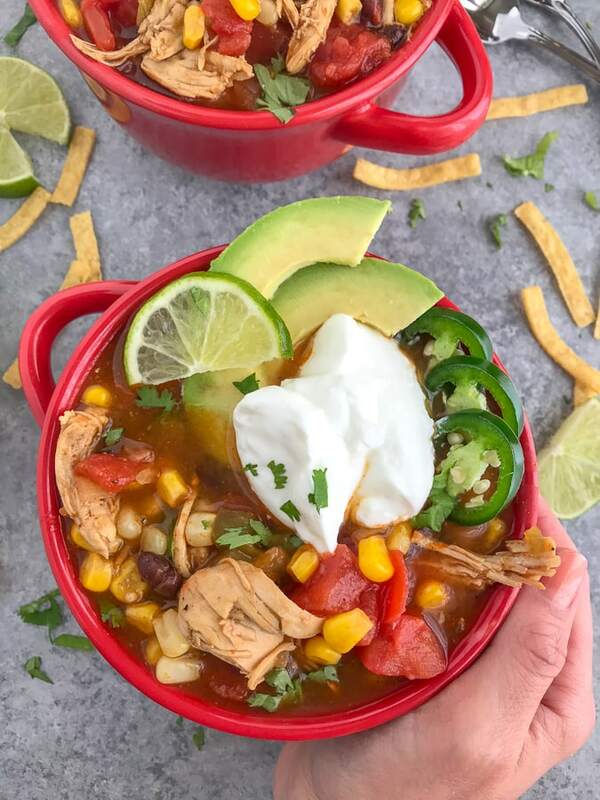 This recipe takes a little prep and is only cooked in the Instant Pot (or Crock Pot), making for easy clean up. And who doesn’t love that?? This recipe is worth staying in for. Worth meal prepping. Worth sharing with your family and friends. And certainly worth going out and grabbing all the ingredients needed for it. 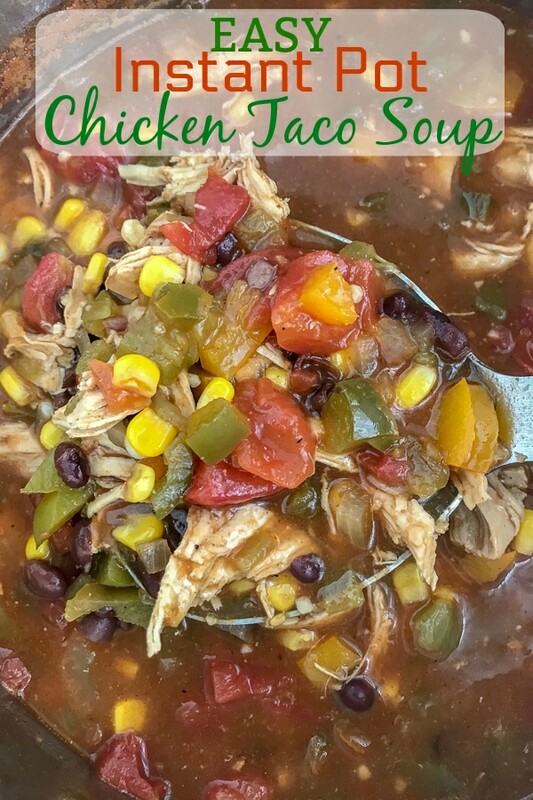 It is super simple to make in the Instant Pot or Crock Pot and perfect for these cold fall days. So delicious you will be making it on the regular! 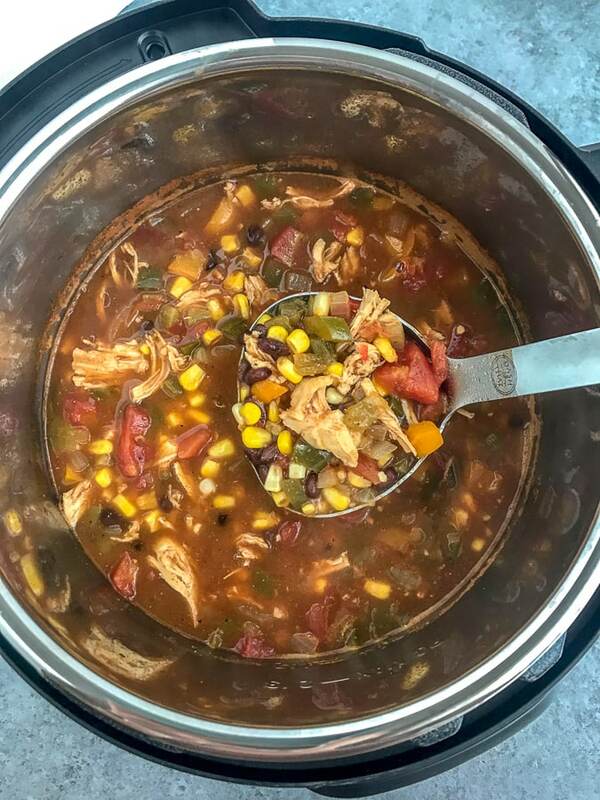 This soup is so scrumptious, we ate it for several days and still had a few meals worth to freeze. Which we decided to take with us up north on our last trip to Traverse City, MI. We rented out a condo for a few nights, so we had a stove, cookware, and everything we needed at our disposal. This warm soup was perfect on one of the cold, rainy evenings we experienced. My husband gobbled up two bowls in one sitting! It’s THAT good! Consider this recipe one of those dump and run type of recipes. The most effort is put into prepping a few of the ingredients and that’s about it. The other thing I love about this recipe is that, aside from your cutting board, the pot and ladle are your only items that need washed! You can top this soup with just about anything. If you’re like me – you add all the toppings! Everything but the kitchen sink as they say, right?? Sliced Jalapeno – perfect if you like to add a little extra kick to your dish. Plain Greek Yogurt or Sour Cream – I always opt for the plain greek yogurt in replacement of sour cream. Not just because I always have it on hand (more so than I ever have sour cream), but also because it is a healthier alternative. Sliced Avocado – because what is any meal without avocado added to it? Especially a mexican dish! Sliced Limes – great to add a fresh squeeze of lime juice over the top for some additional fresh flavor. Freshly Chopped Cilantro – a little extra is always good when you’re a fan! 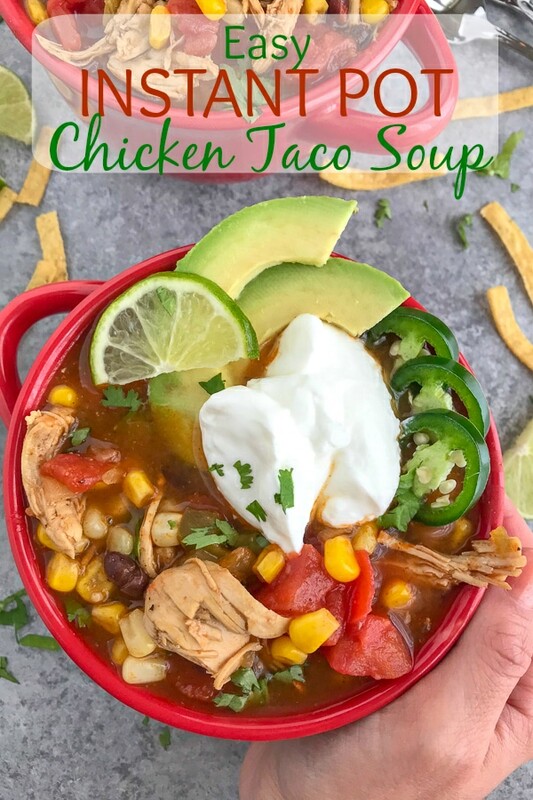 Tortilla Strips or Chips – great replacement for crackers in this soup! I had tortilla strips on hand in the pantry that were on the verge of going stale, so we served this soup with those and then enjoyed any additional bowls with oyster crackers. YUM! Salsa – your favorite kind or any kind. 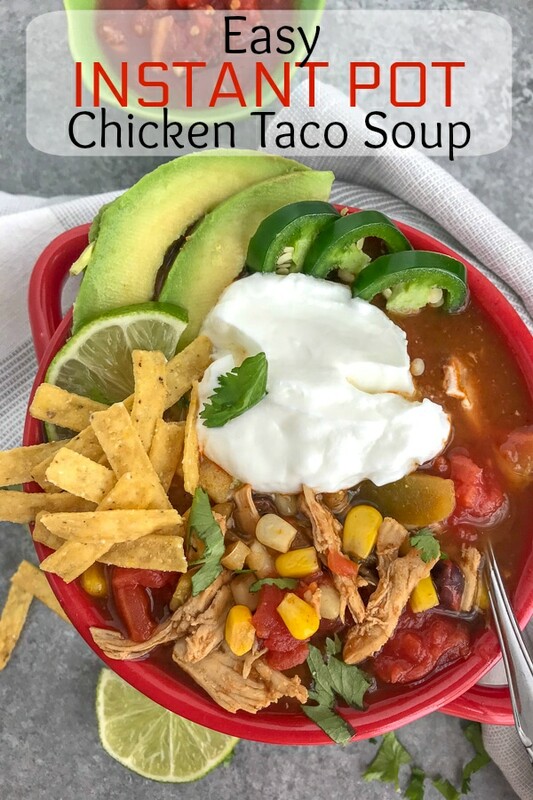 Treat this soup like you would any taco dish! Loaded full of veggies and so much flavor – your taste buds are going to be doing a happy little dance with each bite. Instant Pot Duo 7-in-1 Multi-Use Programmable Pressure Cooker – perfect for a family of 4-6 people with a very easy to use control panel. I primarily bought this version for its size and the yogurt setting! Ha. Just kidding. Sort of! It also has the best reviews. Jenaluca Herb Scissors – I will never use a knife to chopped herbs again! These scissors make chopping herbs so much easier and quicker! Easy to use and easy to clean as well. OXO Good Grips 2 Piece Cutting Board Set – I have an obsession with the OXO brand and for good reason – they make great products! Vacuum Sealer By NutriChef – perfect if you’re looking to freeze your meals! This is what I use for just about everything that I plan to freeze. Nutri-Lock Vacuum Sealer Bags – don’t forget to get the bags! Make sure the soup has cooled down to room temperature or cooler. Store in a proper container suitable for freezing. See the ‘Tools Used’ section above to see the Vacuum Sealer that I use to freeze all of my leftovers! 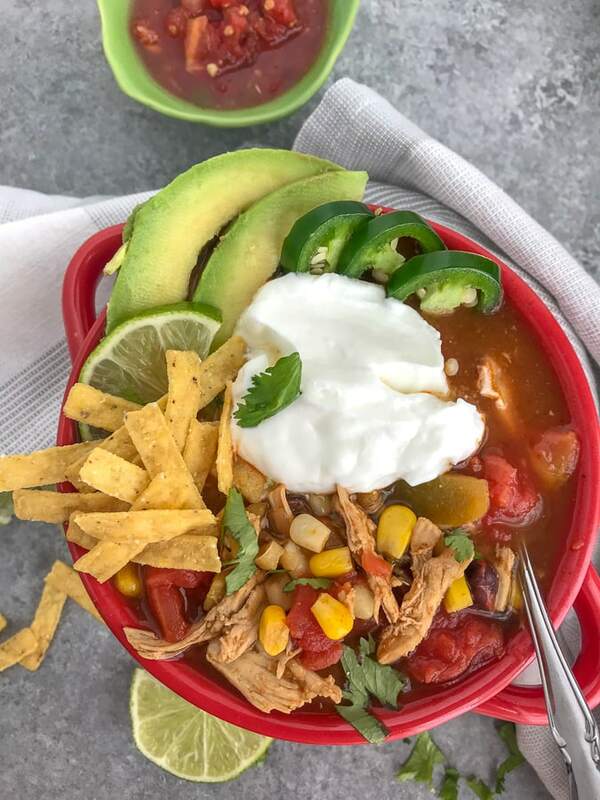 Don’t forget to label the bag or container with the recipe name, ‘Easy Instant Pot Chicken Taco Soup’ and the date before adding the soup. If you use a Ziplock bag or vacuum sealed bags, be sure to lay the soup flat on the rack in the freezer so that it freezes as a thick block. Best for storing and organizing your freezer once it is frozen solid. When ready to reheat, simply remove from the freezer the night before (or morning of) to the sink or fridge. Can easily be reheated in a large pot on the stove over medium-high heat once fully thawed. 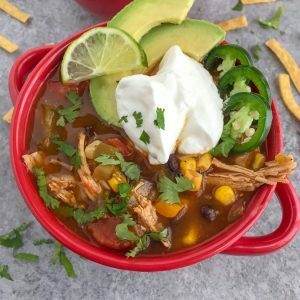 Easy Instant Pot Chicken Taco Soup - an easy to make soup that is perfect for the cool fall and winter months. Takes no time to make, easy clean up, and is great if you love to meal prep or freeze leftovers for later! Using the saute function on the Instant Pot, add 1 tablespoon of olive oil. Saute the onion for approximately 3-4 minutes. Once the onion is translucent, add the minced garlic and cook until fragrant. Approximately 1-2 minutes. 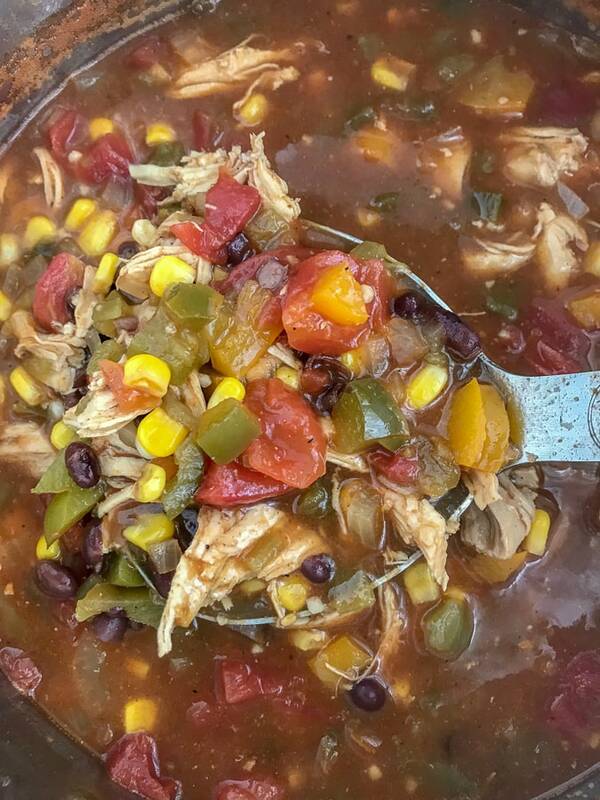 Add the chicken breast with the remaining ingredients, minus the lime juice, corn and black beans, to the pot. Stir well. Secure the lid on and turn the pressure valve to "sealing". Manually select High Pressure and set the timer for 10 minutes. Do a natural pressure release for 5-7 minutes, then carefully release any remaining pressure manually. Remove the lid, shred the chicken breast with two forks and add back to the pot. Add the lime juice, corn, and black beans to the pot. Stir well. Set the pressure cooker to the 'simmer' setting. Stir and cook until heated through. Serve garnished with sour cream or plain greek yogurt, freshly chopped cilantro, salsa, tortilla chips, or your favorite taco toppings! Place all ingredients for the soup, minus the lime juice and garnishments, into the crock pot, saving the chicken breast for last. Stir well to thoroughly combine. Add the chicken so that it is nestled into the crock pot, covered by the broth/stock, and ingredients. Cover and cook on low for approximately 5-6 hours OR on high for 3-4 hours. Remove the chicken from the pot to shred with two forks. Add back into the pot with the lime juice, stirring well to combine. * You can use Chicken Broth or Stock with this recipe. Stock will provide more flavor. * Fire Roasted Jalapenos - this is optional. It will add a bit of heat to the recipe, so if you're not a fan of a little heat - omit. * The corn and black beans are added at the very end, as they are already pre-cooked and only need to be warmed through. * To make it colorful, I did 1/2 green bell pepper and 1/2 yellow bell pepper. Delicious, flavorful, and easy to make. Cooked it on STOVETOp, followed the directions for the crockpot with a few adjustment. My husband loved it. Cant believe its 157 calories and yet so flavorful. Thank you! Hey Rosalie! 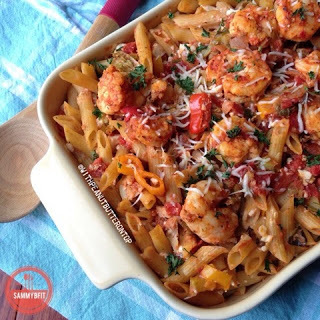 I’m so glad you were able to cook it on the stovetop with success! I’m happy you and your husband enjoyed it so much. Thank you for your sweet comment and rating!